Vitamin and Mineral Blend: Tricalcium phosphate, magnesium oxide, dl-alpha tocopheryl acetate, ascorbic acid, ferrous fumarate, niacinamide, vitamin A acetate, zinc oxide, copper gluconate, d-calcium pantothenate, cholecalciferol, pyridoxine hydrochloride, chromium polynicotinate, thiamine mononitrate, riboflavin, floic acid, d-biotin, potassium iodide. Mix 1 scoop (35g) into 5-6 fl. oz. of water or 2 scoops (70g) into 10-12 fl. oz. of water. Muscle Milk can be used before or after workouts, or prior to bedtime. Use 1-3 servings (35g per serving) per day was a part of a well-balanced diet that include whole foods and other protein sources. ALLERGEN STATEMENT: Contains ingredients derived from milk and soy. This product is manufactured in a facility that processes milk, soy, wheat and eggs. Do not use this product as your sole source of nutrition. EvoPro™ (Micellar Alpha and Beta Caseins and Caseinates, Whey Concentrates Rich in Alpha-Lactalbumin, Whey Isolates, Whey Peptides, Colostrum Extract, L-Glutamine Taurine, Lactoferrin), Leadlipids™ (trans Fat Free Lipid Complex Consisting of Canola Oil, Sunflower and/or Safflower Oil, MCT's L-Carnitine), Fructose, Maltodextrin, Cytovite I™ (Vitamin and Mineral Premix Consisting of Vitamin A Acetate, Cholecalciferol, D-Alpha-Tocopherl Acetate, Ascorbic Acid, Folate, Thiamine Mononitrate, Riboflavin, Niacinamide, Pyridoxine HCl, Cyanocobalamin, Biotin, Pantothenic Acid, Di-Calcium Phosphate, Potassium Iodide, Potassium Chloride, Ferrous Fumerate, Magnesium Oxide, Copper Gluconate, Zinc Oxide, Chromium Nicotinate), GCC (Proprietary Endogenous Creatine Precursor Consisting of Glycocyamine, Betaine Anhydrous), Natural and Artificial Flavors, Acesulfame Potassium, Sucralose, Loy Lecithin. Mix two scoops in 10-12 fl. oz. water. Want even more satisfaction? Mix with low-fat milk. Tastes like a real milk shake. Honest!Before & During WorkoutsTake MUSCLE MILK one hour prior to workout. For a truly awesome workout, take FAST TWITCH™ Power Workout Drink Mix before and during your workout.After WorkoutsTake MUSCLE MILK within one hour of completing your workout. After workouts, the body is in a catabolic state. MUSCLE MILK helps reverse this muscle breakdown by providing the necessary nutrients for muscle synthesis.Prior to BedtimeSleep is actually a catabolic period. Remember, breakfast means to "break your fast." During any fast, you break down precious muscle tissue for energy. Protein blend (calcium and sodium caseinate, milk protein isolate and/or concentrate, whey protein isolate and/or concentrate whey peptides, lactoferrin, l-glutamine, taurine), lean lipids blend (sunflower oil, medium chain triglycerides, canola oil, l-carnitine), maltodextrin, soluble corn fiber, alkalized cocoa powder, natural and artificial flavor, crystalline fructose, vitamin mineral blend, potassium bicarbonate and/or potassium chloride, fructooligosaccarides, salt, acesulfame potassium, sucralose, soy lecithin. Post-Workout: Take Muscle Milk within 30 - 45 minutes after workouts and games. Muscle Milk provides a mix of macronutrients and vitamins & minerals to help start the recovery process. Mix 1 scoop (35g) into 5-6 fl oz water or mix 2 scoops (70g) into 10-12 fl oz water. Protein Blend (Calcium and Sodium Caseinate, Milk Protein Isolate and/or Concentrate, Whey Protein Isolate and/or Concentrate, Whey Peptides, Lactoferrin, L-Glutamine, Taurine), Lean Lipids Blend (Sunflower Oil, Medium Chain Triglycerides, Canola Oil, L-Carnitine), Maltodextrin, Soluble Corn Fiber, Crystalline Fructose, Natural and Artificial Flavor, Vitamin Mineral Blend, Potassium Bicarbonate and/or Potassium Chloride, Fructooligosaccharides, Salt, Acesulfame Potassium, Sucralose, Soy Lecithin. Vitamin and Mineral Blend: Tricalcium Phosphate, Magnesium Oxide, DL-Alpha Tocopheryl Acetate, Ascorbic Acid, Ferrous Fumarate, Niacinamide, Vitamin A Acetate, Zinc Oxide, Copper Gluconate, D-Calcium Pantothenate, Cholecalciferol, Pyridoxine Hydrochloride, Chromium Polynicotinate, Thiamine Mononitrate, Riboflavin, Folic Acid, D-Biotin, Potassium Iodide, Cyanocobalamin. Protein Blend (Calcium and Sodium caseinate, milk protein isolate and/or concentrate, whey protein isolate and/or concentrate, whey peptides, lactoferrin, L-glutamine, taurine), Lean Lipids Blend (sunflower oil, medium chain triglycerides, canola oil, L-carnitine), maltodextrin, soluble corn fiber, alkalized cocoa powder, crystalline fructose, natural and artificial flavor, vitamin mineral blend, potassium bicarbonate and/or potassium chloride, fructooligo-saccarides, salt, acesulfame potassium, sucralose, soy lecithin. Mix 1 scoop (35g) into 5-6 fl.oz water. Or mix 2 scoops (70g) into 10-12 fl.oz water. MUSCLE MILK can be used before workouts, after workouts, or prior to bedtime. Individual nutritional requirements vary depending on gender, body weight, level of activity and exercise/training intensity. CytoSport products complement a healthful eating and hydration plan that, when combined with a balanced exercise program, may contribute to healthy weight management and recovery from exercise. Use 1-3 servings per day as part of a well-balanced diet that includes whole foods and other protein sources. Evopro (micellar alpha and beta caseins and caseinates, whey concentrates rich in alpha-lactalbumin, whey isolates, whey peptides, colostrum extract, l-glutamine, taurine, lactoferrin), leanlipids (trans fat free lipid complex consisting of canola oil, mct's, l-carnitine), fructose, maltodextrin, cytovite i (vitamin and mineral premix consisting of vitamin a acetate, cholecalciferol, d-alphatocopherol acetate, ascorbic acid, folate, thiamine mononitrate, riboflavin, niacinamide, pyridoxine HCl, cyanocobalamin, biotin, pantothenic acid, di-calcium phosphate, potassium iodide, potassium chloride, ferrous fumerate, magnesium oxide, copper gluconate, zinc oxide, chromium nicotinate), chocolate cookie pieces, gcc (proprietary endogenous creatine precursor consisting of glycocyamine, betaine anhydrous), natural and artificial flavors, acesulfame potassium, sucralose, soy lecithin. this product contains ingredients derived from milk, soy and wheat. Mix 2 scoops in 10-12 fl oz water. Want even more satisfaction? Mix with low-fat milk. Tastes like a real milk shake. Honest!BEFORE & DURING WORKOUTSTake MUSCLE MILK one hour prior to workout. For a truly awesome workout, take FAST TWITCH™ Power Workout Drink Mix before and during your workout. AFTER WORKOUTSTake MUSCLE MILK within one hour of completing your workout. After workouts, your ody is in a catabolic state. MUSCLE MILK helps reverse this muscle breakdown by providing the necessary nutrients for muscle synthesis. PRIOR TO BEDTIMESleep is actually a catabolic period. Remember, breakfast means to break your fast. During any fast, you break down precious muscle tissue for energy. Mix two scoops in 10-12 fl. oz. water. Tastes like a real milk shake. Before or During Workouts: Take Muscle Milk one hour prior to workout. For a truly awesome workout, take Fast Twitch Power Drink Mix before and during your workout. After Workouts: Take Muscle Milk within one hour of completing your workout. After workouts, the body is in a catabolic state. Muscle Milk helps reverse this muscle breakdown by providing the necessary nutrients for muscle synthesis.Prior to Bedtime: Sleep is actually a catabolic period. Remember, breakfast means to "break your fast." During any fast, you break down precious muscle tissue for energy. Protein Blend (Calcium and Sodium Caseinate, Milk Protein Isolate and/or Concentrate, Whey Protein Isolate and/or Concentrate, Whey Peptides, Lactoferrin, L-Glutamine, Taurine), Lean Lipids Blend (Sunflower Oil, Medium Chain Triglycerides, Canola Oil, L-Carnitine), Maltodextrin, Soluble Corn Fiber, Alkalized Cocoa Powder, Crystalline Fructose, Natural and Artificial Flavor, Vitamin Mineral Blend, Potassium Bicarbonate and/or Potassium Chloride, Fructooligosaccharides, Salt, Acesulfame Potassium, Sucralose, Soy Lecithin. Vitamin and Mineral Blend: Tricalcium Phosphate, Magnesium Oxide, DL-Alpha Tocopheryl Acetate, Ascorbic Acid, Ferrous Fumarate, Niacinamide, Vitamin A Acetate, Zinc Oxide, Copper Gluconate, D-Calcium Pantothenate, Cholecalciferol, Pyridoxine Hydrochloride, Chromium Polynicotinate, Thiamine Mononitrate, Riboflavin, Folic Acid, D-Biotin, Potassium Iodide, Cyanocobalamin. Protein blend (calcium sodium caseinate, milk protein isolate and/or concentrate, whey protein isolate and/or concentrate whey peptides, lactoferrin, L-glutamine, taurine), lean lipids (sunflower oil, canola oil, medium chain triglycerides, L-carnitine), maltodextrin, soluble corn fiber, crystalline fructose, natural and artificial flavor, alkalized cocoa powder, dicalcium phosphate, potassium chloride, fructooligosaccharides, magnesium oxide, acesulfame potassium, potassium bicarbonate, sucralose, DL-alpha tocopherol acetate, ascorbid acid, ferrous fumarate, vitamin A palmitate, niacinamide, zinc oxide, copper gluconate, d-caldium pantothenate, cholecalciferol, pyridoxine hydrochloride, thiamine mononitrate, riboflavin, chromium chloride, folic acid, biotin, potassium iodide, cyanocobalamin. Muscle Milk can be used before workouts, after workouts, or prior to bedtime. Individual nutritional requirements cary depending on gender, body weight, level of activity and exercise/training intensity. CytoSport products complement a smart eating and hydration plan that, when combined with a balanced exercise program, may contribute to weight management and recovery from exercise. Protein Blend (Calcium and Sodium caseinate, milk protein isolate and/or concentrate, whey protein isolate and/or concentrate, whey peptides, lactoferrin, L-glutamine, taurine) Lean Lipids Blend (sunflower oil, medium chain triglycerides, canola oil, L-carnitine), maltodextrin, soluble corn fiber, crystalline fructose, vitamin mineral blend, natural and artificial flavor, potassium bicarbonate and=or potassium chloride, fructooligo-saccarides, salt, acesulfame potassium, sucralose, soy lecithin. EvoPro, our custom protein, peptide and amino acid matrix designed to closely reflect the nitrogen components and ratios found in human mother's milk (Micellar Alpha and Beta Caseins and Caseinates, Whey Concentrates rich in Alpha-Lactalbumin, Whey Isolates, Whey Peptides, Purified Bovine Colostrum Extract rich in Secretory IgA and IGF-1, Glutamine Peptides, L-Taurine, Lactoferrin). Leanlipids Trans Fat Free Lipid complex selected for thermogenic and unique energy properties (Canola Oil, Sunflower Oil, Enzyme Engineered Polyunsaturated Long-Chain Vegetable Oils, MCTs, L-Cartinine), fructose maltodextrin, Cytovite I, Vitamin and mineral premix consisting of (vitamin A acetate, cholecalciferol, d-alpha-tocopherol acetate, ascorbic acid, folate, thiamine monohydrate, riboflavin, niacinamide, pyridoxine HCL, cyanocobalamin, biotin, pantothenic acid, di-calcium phosphate, potassium iodide, potassium chloride, ferrous fumerate, magnesium oxide, copper gluconate, and zinc oxide), Creatine GCC, our proprietary, endogenous creatine precurser (glycocyamine, betaine anhydrous), natural and artificial flavors, acesulfame potassium, sucralose, chromium nicotinate. Mix 2 scoops in 10-12 fl oz water. Want even more satisfaction? Mix with low-fat milk. Tastes like a real milk shake. Honest! Before or During Workouts: Take Muscle Milk one hour prior to workout. For a truly awesome workout, take Fast Twitch Power Drink Mix before and during your workout. After Workouts: Take Muscle Milk within one hour of completing your workout. After workouts, the body is in a catabolic state. Muscle Milk helps reverse this muscle breakdown by providing the necessary nutrients for muscle synthesis.Prior to Bedtime: Sleep is actually a catabolic period. Remember, breakfast means to "break your fast." During any fast, you break down precious muscle tissue for energy. Calcium sodium caseinate (milk), milk protein isolate, cane sugar, non-dairy creamer (sunflower oil, maltodextrin, sodium casinate (a milk derivative), mono and diglycerides, tocopherols), natural flavors cocoa powder, canola oil, medium chain triglycerides, crystalline fructose, Less than 1% of: potassium chloride, whey protein isolate (milk), soluble corn fiber, inulin, calcium phosphate, magnesium oxide, potassium bicarbonate, stevia extract, dl-alpha tocopheryl acetate, monk fruit extract, ascorbic acid, whey protein hydrolysate (milk), whey protein concentrate (milk), soy lwcithin, ferrous fumarate, maltodextrin, vitamin A palmitate, niacinamide, zinc oxide, copper gluconate, d-calcium pantothenate, lactoferrin (milk), cholecalciferol, pyridoxine hydrochloride, thiamine mononitrate, riboflavin, chromium hydrochloride, folic acid, biotin, potassium iodide, vitamin B12. Mix 1 scoop (35g) into 5-8 fl. oz. of water or 2 scoops (70g) into 10-16 fl. oz. of water. Calcium sodium caseinate (milk), milk protein isolate, cane sugar, non dairy creamer (sunflower oil, maltodextrin, sodium caseinate (a milk derivative), mono-and diglycerides, tocopherols), medium chain triglycerides, crystalline fructose, canola oil, natural flavors, less than 1% of: potassium chloride, whey protein isolate (milk), soluble corn fiber, inulin, magnesium oxide, calcium phosphate, potassium bicarbonate, stevia extract, dl-alpha tocopheryl acetate, ascorbic acid, whey protein concentrate (milk), whey protein hydrolysate (milk), soy lecithin, ferrous fumarate, monk fruit extract, maltodextrin, vitamin A palmitate, niacinamide, zinc oxide, copper gluconate, d-calcium pantothenate, lactoferrin (milk), cholecalciferol, pyridoxine hydrochloride, thiamine mononitrate, riboflavin, chromium chloride, folic acid, biotin, potassium iodide, cyanocobalamin. Mix 2 scoops (70g) into 10-16 fl-oz water Mix 1 scoop (35g) into 5-8 fl-oz water Recommended Usage for Individuals Looking To Build Size and Gain Muscle Mass: To provide 32g of protein, which can aid exercise recovery and muscle growth after workout, mix 2 scoops (70g) MUSCLE MILK® Protein Powder into 10-16 fl. oz. water. Recommended Usage for Individuals That Want Fewer Calories: To provide 16g of protein, mix 1 scoop (35g) MUSCLE MILK® Protein Powder into 5-8 fl. oz. water. MUSCLE MILK® Protein Powder can be used before workouts, after workouts, or prior to bedtime to help build lean muscle. To further maximize recovery from exercise, you can take advantage of the time period 30-60 minutes after exercise, when the body is optimally primed for replenishing fuel stores, and building and repairing muscles. MUSCLE MILK® products complement sound nutrition and hydration practices that, in conjunction with a smart exercise-training program, may contribute to recovery from exercise, gains in lean muscle mass, and weight management. Use as part of a well-balanced diet that includes whole foods and other protein sources. This product contains ingredients derived from milk and soy. This product is manufactured in a plant that processes milk, soy, wheat & eggs. EvoPro™ (calcium and sodium caseinate, milk protein isolate, whey protein isolate, whey protein concentrate, whey peptides, lactoferrin, l-glutamine, taurine), Lean Lipids™ (medium chain triglycerides, sunflower and/or safflower oil, canola oil, l-carnitine), cocoa powder, maltodextrin, resistant maltodextrin, fructose, natural and artificial flavor, Cytovite I™ vitamin and mineral blend, fructo-oligosaccharides, potassium chloride, acesulfame potassium, sucralose and soy lecithin. Mix 2 scoops in 10-12 fl oz water. Want even more satisfaction? Mix with low-fat milk. Tastes like a real milk shake. Honest!Before & During Workouts: Take Muscle Milk one hour prior to workout. After Workouts: Take Muscle Milk within one hour of completing your workout. After workouts, your body is in a catabolic state. Muscle Milk helps reverse this muscle breakdown by providing the necessary nutrients for muscle synthesis. Prior To Bedtime: Sleep is actually a catabolic period. Remember, breakfast means to break your fast. During any fast, you break down precious muscle tissue for energy. This product contains ingredients derived from milk and soy. This product is manufactured in a plant that processes milk, soy, wheat and eggs. Protein Blend (Calcium and Sodium Caseinate, milk protein isolate and/or concentrate, whey protein isolate and/or concentrate, whey peptides, lactoferrin, l-glutamine, taurine), Lean Lipids (sunflower oil, medium chain triglycerides, canola oil, l-carnitine), maltodextrin, soluble corn fiber, natural and artificial flavor, crystalline fructose, lactic acid, vitamin mineral blend, potassium bicarbonate and/or potassium chloride, fructooligosaccarides, acesulfame potassium, gum blend (xantham gum, cellulose gum, carrageenan), sucralose, soy lecithin. MUSCLE MILK can be used before workouts, after workouts, or prior to bedtime. Individual nutritional requirements vary depending on gender, body weight, level of activity and exercise/training intensity. CytoSport products complement a smart eating and hydration plan that, when combined with a balanced exercise program, may contribute to weight management and recovery from exercise. Use as part of a well-balanced diet that includes whole foods and other protein sources. Do not use this product as your sole source of nutrition. Mix 1 scoop (35g) into 5-6 fl-oz water or mix 2 scoops (70g) into 10-12 fl-oz water. MUSCLE MILK can be used before workouts, after workouts, or prior to bedtime. Individual nutritional requirements vary depending on gender, body weight, level of activity and exercise/training intensity. CytoSport products complement a smart eating and hydration plan that, when combined with a balanced exercise program, may contribute to weight management and recovery from exercise. 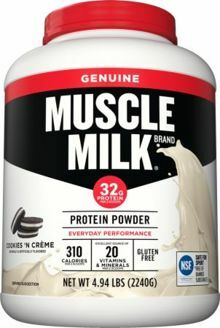 Protein Blend (Calcium Sodium Caseinate, Milk Protein Isolate, Whey Protein Hydrolysate, Whey Protein Concentrate, Lactoferrin, L-Glutamine, Taurine), Maltodextrin, Soluble Corn Fiber, Sunflower Oil, Crystalline Fructose, Canola Oil, Natural And Artificial Flavor, Medium Chain Triglycerides, Phosphate Dicalcium, Less Than 1% Of: Potassium Bicarbonate, Inulin, Magnesium Oxide, Acesulfame-K, Potassium Bicarbonate, Soy Lecithin, Sucralose, Dl-Alpha Tocopheryl Acetate, Ascorbic Acid, Ferrous Fumarate, Vitamin A Palmitate, Niacinamide, Zinc Oxide, Copper Gluconate, Calcium Pantothenate, L-Carnitine, Cholecalciferol, Pyridoxine Hydrochloride, Thiamin Mononitrate, Riboflavin, Chromium Chloride, Folic Acid, Biotin, Potassium Iodide, Cyanocobalamin. AFTER WORKOUTS Take MUSCLE MILK within one hour of completing your workout. After workouts, the body is in a catabolic state. MUSCLE MILK helps reverse this muscle breakdown by providing the necessary nutrients for muscle synthesis. PRIOR TO BEDTIME Sleep is actually a catabolic period. Remember, breakfast means to "break your fast." During any fast, you break down precious muscle tissue for energy. MUSCLE MILK will help you wake up more anabolic. BEFORE & DURING WORKOUTS Take MUSCLE MILK one hour prior to workout. For a truly awesome workout, take FAST TWITCH Power Workout Drink Mix before and during your workout. Mix two scoops in 10-12 fl. oz. water. Tastes like a real milk shake. When Muscle Milk was first introduced, we attempted to emulate human mother's milk, one of nature's most anabolic, complete and balanced foods. In doing that, Muscle Milk created a new category of protein products, while setting a new standards for bother taste and performance. As a result, Muscle Milk has become America's favorite protein drink. Muscle Milk is an excellent source of 20 health-promoting Vitamins and Minerals in each serving. Polyunsaturated and monounsaturated fatty acids from canola and sunflower oil provide essential omega-3, 6, and 9 fatty acids. So, while Muscle Milk may have slightly more fat than low-fat high-carb products, our Lean Lipids are designed to help you get leaner.